HRANA News Agency – After the execution of six Sunni prisoners, their bodies were not given to their families some of whom had traveled from far distances to Rajai Shahr, in Karaj, even after hours of waiting and confusion, and, despite their legitimate requests, just one representative of each family was allowed to see their loved ones’ bodies to identify them and the other members of families and relatives were prevented from attending Bibi Sakineh Cemetery for their children’s funeral ceremony. 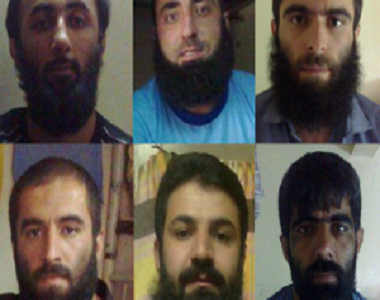 According to the report of Human Rights Activists News Agency in Iran (HRANA), after the execution of Hamed Ahmadi, Kamal Molaei, Jamshid Dehghani, Jahangir Dehghani, Sadiq Mohammadi and Seyed Hadi Hosseini, Sunni prisoners in Rajai Shahr prison in Karaj, their families who had gathered in front of the prison the night before, demanded their loved ones’ bodies who had been executed, to take their bodies to their home city for interment, however, they were confounded from 4am to 4pm as the authorities did not give a clear respond, and eventually, authorities told them that they could not take their bodies to their cities and they would be buried in cemetery of Bibi Sakineh, due to the security system’s decision. Despite being forced regarding the burial place, the families and relatives of executed prisoners demanded participation in the funeral of those prisoners, on the basis of their religious custom that was their legal rights, but, it was also rejected. However, unlike the current rules, only one representative from each family was selected to participate in the identification of executed prisoners and Salat for them. The other family members and relatives who were about to 50 people were driven out of Bibi Sakina cemetery, by police and security forces. It should be noted that regardless the execution of these civilians, rejecting to give the bodies of executed prisoners to their families or preventing them from attending the funerals, and restriction to the religious practice for the executed prisoners, is illegal action which is frequently enforced for political and security executed prisoners. Hamed Ahmadi, Kamal Molaei, Jahangir and Jamshid Dehghani had been arrested on charges of involvement in the murder of Mamoosta Molla Mohammad Sheikhal-Islam, a former Kurdish member of the Assembly of Experts. However, the Amnesty International had issued a statement in connection with these Sunni prisoners, previously, to emphasis: “The prisoners claim that their arrest was two months before the assassination of the Sheikhal-Islam.” The four prisoners were later exonerated from the Molla Mohammed Sheikhal-Islam assassination, and were charged with “Combat with the God through supporting Kurdish opposition parties” and were sentenced to death. Other two prisoners, that were executed, Seddigh Mohammadi and Hadi Hosseini, were arrested in June 2009 and then were charged with connection with “Salafi Groups” and sentenced to death.